A house is surrounded by flames in the village of Varnavas, 50 km north of Athens Saturday. More than seven wildfires fanned by strong winds broke out around Athens raging into inhabited areas and threatening homes and forests. Photo by EPA/BGNES. The great forest fire that broke out Saturday evening north-east of the Greek capital Athens has been restrained, report local firefighting authorities. The fire started in hard-access locations, but made its way through 800 hectares of woods and shrubs to reach human dwellings in the area, reaching villages of Varnavas and Mikrochori. According to fire authorities quoted by BGNES by noon Sunday there are no active fire fronts and fireman are extinguishing smaller flares. A great number of manpower and equipment was used in the operation which involved the help of the Greek army. People, including tourists, have been evacuated from the area. Some fires around Athens are still flaring, say reports. Current strong winds may contribute to fire spreading. 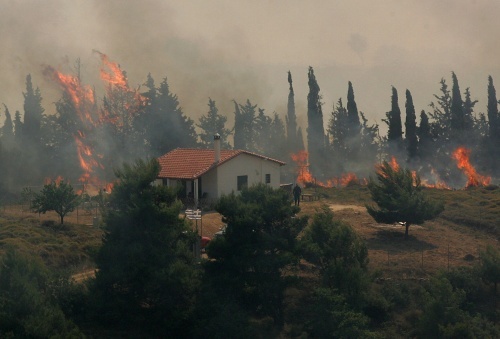 Great wildfires devastated Greece in the arid summer of 2007, causing the deaths of 84 persons.